This week the weather has not cooperated for night observing or solar observing during the day. So, I spent the week at physics colloquia at CSULB and preparing for our upcoming road trip to Northern California. fit together, including observations in the radio, X-ray, gamma and neutrino spectrum. The discussion about cooper pairs and superconducting metamorphosis was way over my head but I tried to take notes for later review. At least I could recognize how the changing quantum states led to propagation of cooper pairs through the ferromagnetic material. I had hoped for a little more understanding since I had previously spent about five years working on the development of a motor drive that could drive a large superconducting motor. I had never really understood much of the theory of superC, but it was fun working out the design and lab testing for a large five megawatt or similar motor, even though it never got into production. Oh, and for those of you who follow the campus fashion review, the weather was a little too cold for short shorts. Oh well, next time. So, as I mentioned, a part of this week was assigned for preparation for the upcoming road trip so the telescope and equipment had to be got ready for travel. The telescope tube assembly already came with a great shipping case, so it was already ok to travel. So this week's photo is of the packaging developed to protect the mount and tripod during the road trip. We are sort of considering this a trial run to get ready for other star parties and of course the trip to Casper, WY, for the 2017 eclipse. The first picture shows the Celestron AVX mount. It has a lot of knobs, motors and electronics that need to be protected a bit for travel. The 2nd photo shows the mount and counterweight safely packaged in its home built enclosure. I just bought a Pelican case, full of foam, and cut out the foam to match the mount. Warning for all of you do it yourself experimenters. Don't cut out the foam in the first location that you find convenient, like your bedroom. I now know from first hand experience that even though you think you can collect and sweep up the cuttings, you can't. My inability to do so was brought to my attention by the other observatory staff, Peggy and Danny, who found various foam pieces latter and we're definitely not pleased. I barely escaped without having to take a remedial training session for misbehaving husbands. The third photo just shows the tripod in its heavy duty duffle bag packaging. So, with everything packed up, all we need to collect now is the camera bag, the lens bag, the battery pack, chargers, and miscellaneous and get ready to hit the road. 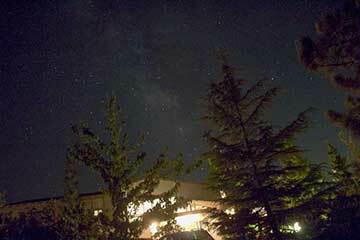 Hopefully, we will have clear skies in Northern California and can return with some real astro photos.